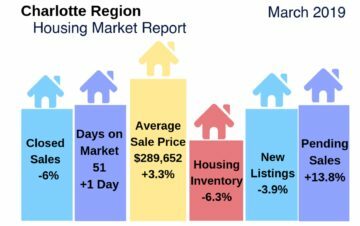 March 2019 Charlotte region housing update. 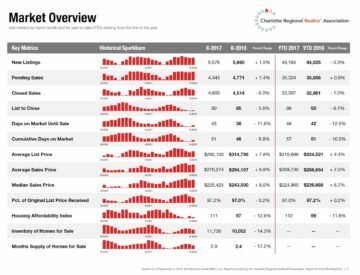 Charlotte region remained a seller’s market in March 2019 with inventory remaining extremely tight, resulting in higher home list and sale prices due to continued high buyer demand. Closed sales were down, but pending sales were up 12.4% year-over-year. The housing affordability index continued to decrease, as well. Months supply of homes remained very low at 2.2 months and even lower for homes priced under $200,000. Average sale prices have increased each month this year to-date. February 2019 Charlotte region housing update. 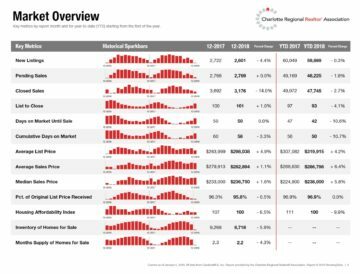 Charlotte region remained a seller’s market in February 2019 with inventory remaining tight, resulting in higher home list and sale prices due to continued high buyer demand. Closed sales were down slightly, but pending sales up 12.4%. Days on market were also down as compared with one year ago. The housing affordability index continues to decrease, as well. Months supply of homes is very low at 2.1 months, but even lower for homes priced under $200,000. January 2019 Charlotte region housing update. Charlotte region remained a seller’s market in January 2019 with inventory remaining tight, resulting in higher home list and sale prices due to continued high buyer demand, although the price increases are not quite as high as in previous months and last year. Closed sales were down, but pending sales up. Days on market were also down. The housing affordability index continues to decrease, as well. December 2018 Charlotte region housing update. 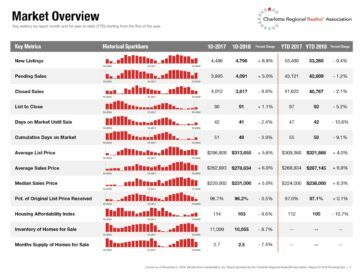 Charlotte region remained a seller’s market in December 2018 with inventory remaining tight, resulting in higher home list and sale prices due to continued high buyer demand, although the price increases are not quite as high as in previous months and last year. November 2018 Charlotte region housing update. Charlotte region remained a seller’s market in November 2018 with inventory remaining tight and resulting in higher home list and sale prices, coupled with shorter days on market, especially for affordable homes. Closed sales were down in November, but pending sales were up. Charlotte region remained a seller’s market in October 2018 with demand for homes outpacing supply in some parts of the region, resulting in higher home prices, shorter days on market, tight inventory, especially for affordable homes. 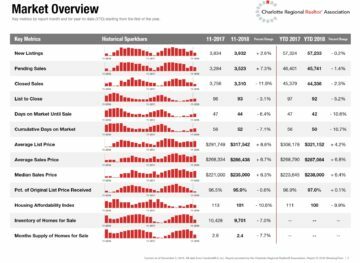 Charlotte region continues to be a seller’s market with demand for home prices outpacing supply in many parts of the region, resulting in higher home prices, shorter days on market, tight inventory.